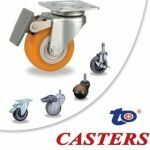 Taiwan Casters & Wheels Manufacturer - Company Profile - Casters & Wheels Manufacturer in Taiwan.- Provide You The Very Best Caster. TUNG TIEN ENTERPRISE CO., LTD. is the most famous Casters & Wheels Manufacturer, Supplier and Exporter with a factory in Taiwan. 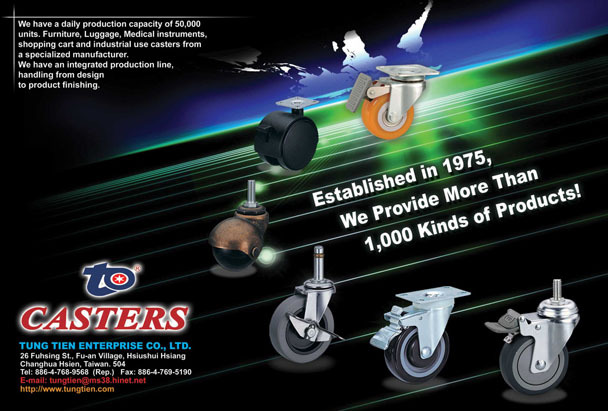 Established in 1975, we provide more than 1,000 kinds of caster & wheel. Our daily production capacity is up to 50,000 units. Furniture, luggage, medical instruments, shopping cart and industrial use casters form a specialized manufacture.We have an integrated production line handling from design to product finishing. With market demands, we never stop improvement and keep developing new products. We can offer an extensive range of casters & wheels for almost every application. All our casters are well made in Taiwan. Please contact us with your requirements for a quick quotation for casters. To fully meet customer's satifaction is our only goal and being flexible is the reason why we are successful.